Congratulations to PPCS middle school teacher Rebekka Boysen-Taylor!!! 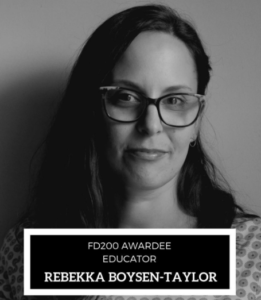 Rebekka was recently selected as one of the FD200. The Frederick Douglass 200 is a project to honor the impact of 200 living individuals who best embody the work and spirit of Douglass in recognition of the bicentennial of his birth. The FD200 has been curated and compiled by the Frederick Douglass Family Initiatives the Antiracist Research and Policy Center at American University in Washington DC.